On this page we compare Wedpics with Wedbox and give you an overview of how they differ from each other. Wedpics leaves a lot to be desired when it comes to modern design, and it lacks the warm colors and the style one would expect from a wedding photo app. Wedpics was created for the US market, which is obvious. It has been heavily backed by investors for the last 4 years, and now users are paying the price – they are being charged an extremely high price for the service. Fortunately, there are some great other apps to choose between out there. When we compared terms and conditions from Wedpics and Wedbox, we found an ESSENTIAL difference regarding the agreements. What terms are you, the customer, actually saying yes to when using these apps? We were surprised to discover that when you use the Wedpics app, you actually give them the right to use and share your pictures. We don’t know the purpose of this, but it could mean your pictures might end up somewhere you don’t want them to. Wedbox photo app is a multi-language app, which means anyone can use it, anywhere. It has got a fresh design and appealing colors which make you want to interact in the sharing. Wedbox is a beautiful app and simply perfect for a stylish wedding. 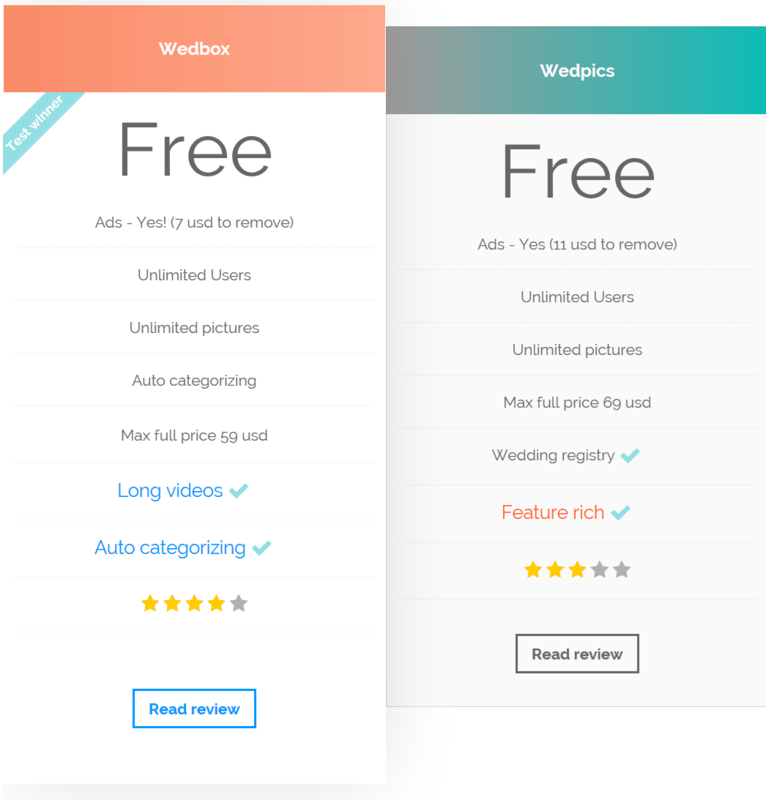 When comparing Wedpics to Wedbox, you discover that Wedbox is more of an all-around app in terms of design, usability, and languages. In addition to that, it is also a less expensive alternative.